Who can remember the Power Station at the top end of Lister Drive just before the railway bridge. I think the cooling tower was the first of it's kind in the UK. The hill after the bridge was known to us as Donkeys Hill. You might recognize this pic. 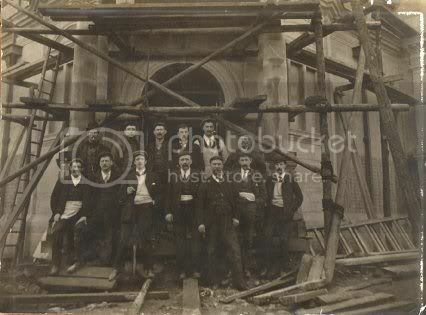 It is my granddad and his crew building the library on the corner of Lister Drive about 1904/5. I lived in that area for years and never heard the hill called Donkey Hill. Must be a new term since I left. Last edited by shytalk; 03-19-2007 at 12:15 AM. Donkies Hill was a nicname when I was a kid. As you walk up Lister drive from Green Lane at the top the road turns left over the bridge. At the top of the road on the right was a small footpath going down hill towards the boating lake in the park. It was that Hill that was called, by us kids, as Donkies Hill. I have not been in that area for many many years though so it all may have changed. I was born in White Rock street but over my early days we lived in all the Three colours as well as Lombard Street so 'the parks' (two of them) where my play areas. I did not know there was a power station still there ??? What are you on about, Its still bleeding there. Unless it was different years before. It is now a big square thingie, I dont remember it being any different before but would still like to see though. No one has said that it isn't still bleeding there. But what is it used for, now? There was White Rock, Grey Rock and Red Rock if I'm not mistaken. Radio Merseyside DJ Billy Butler was brought up in one of those streets - he often mentions it. Lister Drive is one of the symbols that is on our crest in our Masonic Lodge. You meen Mrs Butlers Eldest. Yes we knew the family. a pet shop, the fish actually swim around now in what used to be the "small pool"
Hi, i'm a photographer researching Lister Drive Library. This photograph is fantastic! By any chance do you have anymore of these? Hi, That is my picture, my niece has the original. You are welcome to use it if you want to. I no longer use the nickname Shytalk. I've inserted a couple of scanned pics in the 'Lister Drive Tuebrook' thread. They include the Cooling towers at Lister drive power station.